Love is in the Air seasonal events coincides with and is inspired from Valentine’s Day which has become the traditional time for expressions and tokens of love to be exchanged. The festival revolves around the completion of a quest line and the dailies that enable one to loot love charms and which reward love tokens. The goblin vendor (the lovely merchants) in booths in the main factional cities will trade almost everything (rose petals, candies, chocolates, arrows, rockets etc) needed for the season for the right number of love tokens. In addition the quest line opens up a seasonal boss encounter which can drop justice points, mount, pet and gear. Note: The bouquet of ebon (or red) roses as Patch4.0.6 (2011) are no longer available in Lich King dungeons. See below for details of drops in Cata dungeons). Inspector Snip Snagglebolt (in Stormwind) or Snap Snagglebolt (in Orgrimmar)asks you to investigate the suspicious activities of Crown Chemical Co., the new purveyor of perfume and romantic merchandise in town. The lead in quest Uncommon Scents from a junior inspector or junior detective in other major cities sends the hero to speak to Inspector Snagglebolt (near the bank in Stormwind and outside Garrosh Hall in Orgrimmar). In Something Stinks Snagglebolt asks you to sample suspicious perfume emanating from six guards of Stormwind and Orgrimmar respectively. I must say, it seems somewhat incongruous seeing orc guards morosely stalking about Org in a cloud of pink perfume. Having analysed the sample Snip in Pilfering Perfume provides you with a goblin parcel runner disguise (you will be able to steer but can’t stop running) so that you can obtaining a box of the chemicals. In the guise of the goblin run out the front gate and to the left (in either city) until you see a small stack of boxes decorated with pink love hearts. Run past and then back to Snagglebolt once the suppliers throw a box on to your back. Having determined that the perfume is suspicious and that Snivel Rustrocket is the main supplier, Snip (or Snap) sends you to question Marion Sutton in Fireworks at the Guilded Rose – the an upstairs room in this Inn in the Trade District of Stormwind (Alliance) or, in Snivel’s Girlfriend, to speak to Roka inside Gotri’s Travelling Gear shop in the Drag in Orgrimmar(Horde). In Hot on the Trial Marion or Rota will tell you that Snivel planned to go to the bank, auction house (AH) and barber - all three are in the Trade District in Stormwind while the Bank and AH are in the Valley of Strength in Orgimmar, the barber is just north of the tunnel to the Troll area in the Valley of Spirits. Snivel will stun or daze you or disappear in a puff of smoke as you enter the buildings. Return to Marion or Rota. Snivel will give you a ledger which you return to Snip or Snap. The inspector will now ask you to eliminate 5 Crown thugs and a wagon (Crushing the Crown) in a level & faction appropriate area. Completing this quest completes the quest line and and gives the achievement Dangerous Love. Once this quest line is completed (it is completed only once and is not repeated in subsequent years) a dailyCrushing the Crown (to all level players) and You’ve Been Served Quest line/daily (for higher level players) becomes available. Completion of the above quest line also opens up another quest line (Man on the Inside, You’re Being Served) that summons the Shadowfang Keep bosses (for high-end players). Completing the Dangerous Love quest line makes available a daily encounter with a triad of perfume spraying elite 87 bosses (You’ve been Served quest line) with possible rare mount, pet and other prized drops for higher level players. Defeat of Apothecary Hummel and his cronies (the trio of Crown Chemicals Co Apothecaries) gives Tough Love achievement (not required for meta-achievement What a Long, Strange Trip it’s Been). The first encounter each day drops a Faded Lovely Greeting Card which starts the quest Something is in the Air (and it ain’t love), which, on handing in to Snip (Alliance) or Snap (Horde) rewards a heart shaped box. The box contains 24 justice points and may contain other prizes). Toons 84+ can queue via the dungeon finder or by speaking to the Steamwheedle Shyster (Dungeonmaster – a purple clothed goblin) situated in most of the major cities. For Alliance, he is the standing just outside the auction house in Stormwind, on the bridge between the bank and Auction House in Ironforge, in front of the bank tree in Darnassus and between the bank and entrance to the Vault of Lights, Exodar. For Horde he is just to the left (west) of the ramp into Grommash Hold, Valley of Strength in Orgrimmar, standing by the north ramp to the bank in the inner ring of the Trade Quarter, Undercity, beside the Thunderbluff Weapons shop close to the bridge to hunter rise, innkeeper, bank, auction house and Warchief Command Board on the southeast side of lower tier in central Thunderbluff and outside the Bank of Silvermoon in the Bazaar, Silvermoon City. A Shyster is also standing outside both banks in Dalaran. At present toons 80-83 are still not able to access use the Dungeon finderor the Shyster Dungeonmaster for the Crown Co encounter (with the recent fix you can now ask to queue but the queue screen flashes past too quickly to respond it). There are eight dailies (with 7 available each day) associated with the Love is in the Air seasonal event. They award love tokens which are the main currency of the festival as well as gold, experience (and rep). Two alternative/alternating dailies A Perfect Puff of Perfume or Bonbon Blitz that involves targeting 10 players and/or NPCs (eg with either perfume or chocolate samples) and rewards 5 love tokens. The daily can be picked up in any of your factions cities but can only be completed once a day. Four different dailies per faction can be picked up from Mr Kwee Q. Peddlefeet in each factional city in which you are encouraged to give a Love bracelet (as a token of admiration) to the factional leader of that city. The leaders of the Alliance are as follows: King Varian Wrynn in the throne room of Stormwind Keep, Stormwind (a Gift for the King of Stormwind); Muradin Bronzebeard in front of the central throne in the High Seat in Ironforge (Gift for the Lord of Ironforge); High Priestess Tyrande Whisperwind on the upper balcony in the Temple of the Moon, Darnassus (Gift to the High Priestess) and the Prophet Velen is standing on the platform in the northwest corner of the Vault of Lights, Exodar (A Gift for the Prophet). The leaders of the Horde include: Garrosh Hellscream in Grommash Hold, Valley of Strength, Orgrimmar (A Gift for theWarchief); Baine Bloodhoof in on the highest of the three plateaus or tiers of central Thunderbluff (A Gift to the High Chieftan); Lady Sylvanus Windrunner inthe Royal Quarter accessed via the Apocthecarium, Undercity (Gift to the Banshee Queen) and Lor’themar Theronl in the Sunfury Spire in the Court of the Sun, Silvermoon City(A Gift for the Regent Lord of Quel’thalas). NOTE: During the first few days of the 2011, the goblin enterprise has not yet realized the change in leadership in the aftermath of Deathwing’s rampage in Irongforge (Muradin rather than his brother Magni) and Thunderbluff (Baine rather than his father Cairne Bloodhoof). However, this bug has been fixed and the new leaders are recognized and it is possible to hand in the charm bracelets to complete the daily at Ironforge and Thunderbluff. The charm bracelets (not soulbound) presented to the factional leaders are made from10 love charms (soulbound) that drop from mobs of appropriate level that give experience and/or honor (ie not grey to you) as long as you carry a Lovely Charm Collector Kit (received from the quest giver). Charms drop without needing to loot and will continue to drop as long as you have the kit though the drop rate can be somewhat variable. In a dungeon party, the healer will still receive charms even if they do no damage. Rewards include 5 love tokens and a specific buff (a gift of adoration) with different stats depending on the factional leader. Completing the daily for all four of your faction’s leaders gives Nation of Adoration achievement while making 12 bracelets completes the achievement Charming. Charm bracelets can also be exchanged for one love token from the Lovely vendor. 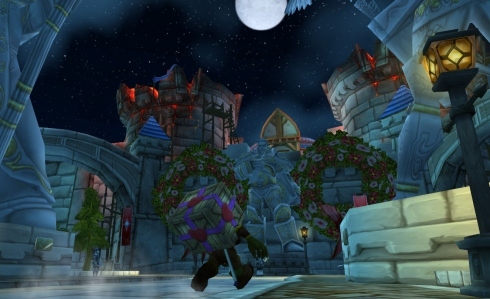 A daily Crushing the Crown is given by Inspector Snagglebolt to take out one wagon (using the Khorium bomb provided) and 5 Crown chemical employees in an area at the appropriate level (eg Silverpine Forest, Alterac Valley, Terrokar Forest, Crystalsong Forest, Uldum). A daily You’ve Been Served to defeat Hummel which gives a Heat Shaped box in addition to the boss drops. All boxes contain 24 justice points and may contain other elite rewards. Rose petals, candies, boxes of chocolate, silver-shafted arrows, lovely dress box, dinner suit box, romantic picnic basket, love fool and Peddlefeet can all be purchased from the Lovely Merchant for the appropriate amount of love tokens (ranging from 1 love token for various perfumes to 40 for a truesliver shafted arrow which teaches you to summon Peddlefeet). A glitch in 2011 with not being able to purchase some items has been fixed. All the achievements (EXCEPT for Lovely Luck is on Your Side, Permapeddle and Tough Love) are necessary for the meta-achievment Fool for Love which rewards the title Love Fool and counts towards the meta-achievement What a Long Strange Trip it’s Been and the Voilet Proto-Drake. Players need to be targeted with silver arrows for Shafted and with rose petals (in specific race-class combinations) for Fistful of Love. Auction houses, Banks in Orgrimmar or Stormwind are the most frequented places these days. Other places that might be fruitful are starting zones, neutral cities (e.g. Booty Bay, Evertook, Gadgetzhan, Shattrath, Dalaran though don’t expect any great numbers even, or especially, in Dalaran), new Cataclysm questing areas and Battlegrounds. A useful tip for battlegrounds is to check the list of the other faction’s players at the beginning of the bg for the player names of the combinations you still need and then use a macro (eg /tar “player name1″ /tar “player name 2″ etc) to locate them more easily. Another, more risky strategy (which I used on my dwarf pallie after failing to find the last combo – a troll rogue – in 4-5 different bgs) is to hover high over the most populated areas of Orgrimmar (if Alliance) or Stormwind (if Horde) until you find the combination you need, target that player, then swoop straight down & sprinkle with rose petals. Remember to hover high enough so that you don’t aggro the flying guards but low enough so you can mouse over players (mere specks below). In both bgs and the factional cities, make sure the rose petals are on your action bar as you may only have a small window of opportunity to shower your target. Candies and Chocolates need to be sampled; Lovely Dress box opened and Peddlefeet learnt for (in order) the Be Mine! ; Sweet Tooth; Lovely Luck is on Your Side and Permapeddle achievements. With the peddlefeet companion pet it is just a matter of earning 40 love tokens – with Be Mine!, Sweet Tooth and Lovely Luck is on Your Side – you need to get the right combination of candies, chocolates or the right color of dress - which can take time and tokens. However, (some) chocolates and all sweets can be put in guild bank and/or traded though not posted to alts (as they are “conjured” items). The player needs sufficient to drink (to get smashed), some perfume (purchased from Lovely Merchant) and rose petals before puckering up (Flirting with Diaster). Sraaz is a gnome pie vendor who paths around the forge in Ironforge while Jeremiah Payson is a cockroach pet vendor, can found in central ring of Undercity. Lonely? requires enjoying a buttermilk delight during a romantic picnic (set up picnic basket) in Dalaran with another player. (Don’t forget the buttermilk as sharing the picnic is not sufficient to get the achievement.) In 2011, finding someone in Dalaran – let alone someone wanting to share chocolates and a romantic picnic is somewhat of a rare achievement! The rocket’s Pink Glare requires letting of 10 rockets in 20 seconds. Rather simple (though as with Frenzied Firecracker and Rockets’ Red Glare this can be difficult if you have lag or high latency rates so the tips given in Lunar Fireworks Frenzy apply to this achievement too). For I pitied the Fool, Love fools (single use items purchased from vendor) need to be deployed and pitied in various places (Wintergrasp; Battle ring of Gurubashi Arena; Arathi Basin Blacksmith; Culling of Stratholme; Naxxramus). The player must actually enter Naxx which limits this achievement to 80+s). Corla Herald of Twilight 2nd boss in Blackrock Caverns (normal or heroic). There are also reports of the bouquests dropping from such as Queen Azshara in Well of Eternity (second boss), Echo of Sylvanas in End Time and Asira Dawnslayer (second boss) in Hour of Twilight. It is no longer available from Northrend heroic or normal dungeons ((Prince Keleseth in Utgarde Keep, Maiden of Grief in Halls of Stone and Prince Taldaram in Ahn’kahet: Old Kingdom). Dangerous Love and Tough Love are gained by completing the Snagglebolt quest line and defeating Hummel and his associates respectively. Ironically, St Valentine’s Day has been celebrated since 400 AD in memory of at least two people of that name (Valentine of Rome and Valentine of Terni) who died in a couple of the many fierce state-sponsored killing sprees against Christians in the early centuries of the current era. It is only in the 14th century through the influence of Chaucer that it became associated with romantic love. Today it is an opportunity to share romantic dinners and outings and to exchange cards, flowers, chocolates and gifts between those romantically involved or those who hope to be. It is also a grand opportunity for the goblins … I mean the Western mercantile interests … to sell themed and related merchandise and experiences to all interested parties. The need to love and be loved seems hard wired in the human psyche – the love between mother (or father) and child, the love of family and friends and, indeed, romantic love. The initial feelings of romance can be exhilarating yet romance born in a flurry of desire and high hopes often fall short of a fairy tale ending. As the Shrek films explore, it takes a gritty and mutual love that can survive the ups and downs of a relationship to “live happily ever after.” Love – and who we choose to love – gives meaning and direction to life; it gives joy and heartache, comfort and anxiety, safety and danger. At its extreme, for good or ill, love is willing to die for the loved one whether child, partner, country or beliefs (as with Valentine of Rome and of Terni). As the Love is in the Air festival suggests love can be sweet, charming and delightful, it can be counterfeit, commercial and manipulative, and it can even be tough and dangerous but in the end it is much more than this for true, tough, forgiving, enduring love is our lifeline, love is divine, love is from God.